This 4 day Lares hike takes you from Cusco to the village Calca in the Sacred Valley from here you will drive into the mountains to start your first day of hiking. 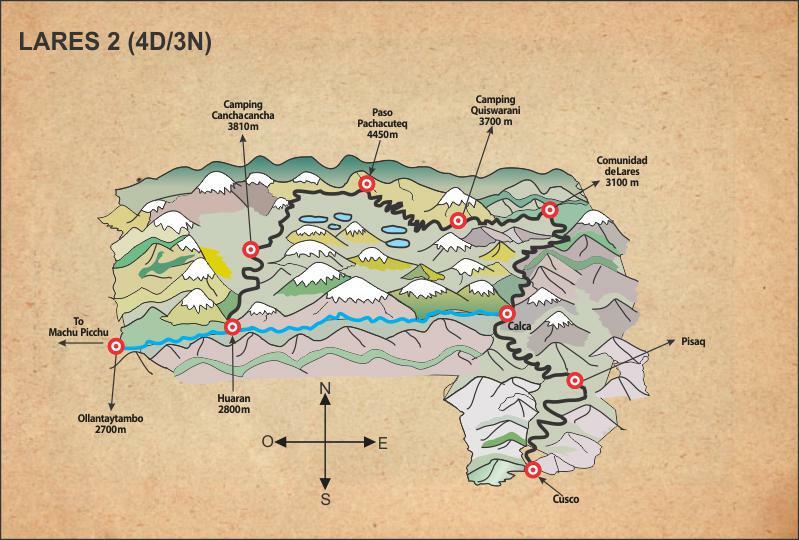 You will start this hike surrounded by beautiful mountains and lakes and even touch the 4000 meters for the first time. This hike, besides being a great alternative when the Inca Trail sells out is a hike with a secondary focus on the beautiful and authentic Andean villages you will be visiting. The hike takes you around the Sacred Valley en ends in the Inca town of Ollantaytambo from where you will take the train to Machu Picchu. You will be picked up from your hotel and leave Cusco around 06:00. You will enjoy a scenic drive through the Sacred Valley, passing through Pisac and stopping quickly in the town of Calca. Departing Calca around 08:00 we head off for the 2-hour drive to Huacahuasi (3700m) from where we will continue to Lares, the starting point of your hike. Here you will also find some thermal baths and if time allows we can enjoy a quick dip in these healing waters. Along the way you will be able to observe small Andean communities, spectacular mountain landscapes, herds of llamas and alpacas. We will start to hike up a small valley until we arrive at a lake, from here we have a steep climb up a narrow trail to the top of the first pass known as Abra Huillquijasa (4200m). Below you will see a series of stunning turquoise lakes. After lunch we trek to the town of Cuncani (3750m) at the bottom of the valley. We will arrive to Cuncani at approximately 4pm where we will set up camp. After a 6Am wake up call, we will set off for a 2 hours downhill hike to the Chancachaca Valley (3600m). We will continue walking up for about 1½ hours to the small village of Huacawasi (3700m) where you will see many houses built from stone and have thatched roofs. The people of this village produce beautiful colorful textiles and you can even learn weaving techniques. We will rest and have lunch here while you spend time with the local Andean people. We will then continue to climb for approximately 2 hours to the top of Ipsayccasa pass at 4500m and is the highest pass along the trek. From here we get stunning views of the surrounding mountains. We will descend gently for about 1 hour until we reach the site of our second night's camp beside the beautiful Ipsaycocha Lake. After two full days of hiking today is somewhat easier. After an early breakfast we walk downhill through a wide-open valley for about 2½ hours until we arrive at the village of Patacancha. We will have a chance to view some textiles made by the people of this community - the high quality weavings are famous for their intricate designs reflecting aspects of their everyday lives and culture. After we also get the chance to walk slowly down the valley to Willoq, another Quechua village where the locals still wear their traditional dress and are proud to maintain their cultural identity. From Patacancha we will take our transport further down the valley to Inca town of Ollantaytambo where we will rest and have lunch, then catch our afternoon train to Aguas Calientes. This is an amazing journey that starts in the Quechua highlands and slowly descends to lush tropical vegetation as we near Aguas Calientes. Total journey time about 1½ hours. Tonight we stay in the small quaint town of Machu Picchu. After your 5AM breakfast we will take the bus to Machu Picchu. Once on the site you will enjoy a 2 hour guided tour. After the tour you will have free time to explore the site for yourself. In the afternoon you can choose to either enjoy lunch just outside the ruins or take the bus back to Aguas Calientes to explore this small village. The train back to Cusco departs late afternoon so your estimated time of arrival is approximately 9pm.